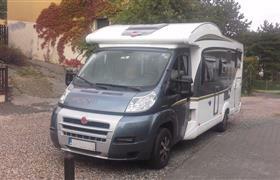 The main advantage of this motorhome is its compactness. It is a semi-integrated motorhome, there are two beds, one of them is a folding one and the other one is a full-size bed in the vehicle rear bodywork. Here you can find a true comfort that is typical for Burstner motorhomes.